The 19th May 2010 turned out to be one of the best chases we have ever had, as is normal this was a changeover day so the early part of the day we were down at DFW Airport watching the early events unfold. Today would see a dual risk from an Outflow Boundary Set-Up in Northern Oklahoma and an explosive Dryline Set-Up further South trailing into North West Texas. As guests were arriving on International flights during the day the plan was to leave 1 car at DFW & The early arrivals could come along for a bonus chase day leaving DFW Around about 3pm. The early High Risk duly fired around 2pm and a Lone East moving Supercell near Hennessey put down multiple Tornadoes, this was gut wrenching watching this unfold 220 miles away to the South, but there were also signs the Dryline was sharpening west of I-35. We finally left DFW Around 4pm and headed North along I-35 To try and beat the rush hour traffic out of the Metroplex, we got into Oklahoma around about 530pm and headed West then North to sit and watch the dryline. At first cells were struggling and collapsing, one cell east of Dibble did become Tornado Warned and we noted a nice Wall Cloud, this cell was moving North East and we started to get cored by mainly dime sized hail, at this point our 2 cars becaem separated and I made the decision to blast south, after a few minutes I came out of the hail and just in front of me to my South West a beautiful White Cone Tornado was about to cross the road in front of us, I let it move to my east and then went east at a crossroads near Dibble. After this the storm became very High Based and my attention was drawn to a lone Storm firing about 45 miles to my South just North West of Ardmore. So back South down I-35 We went after the Tail end Charlie. We made great time getting south and pulled off the Interstate near Wynewood, I went West then South and pulled up to observe a lovely LP Supercell, about this time we started to hear the Hail Roar from this cell and noticed on the warnings of 4" Hail falling close to our location, the cell was also transitioning into a Classic Supercell at this point and the rotation started to gather strength. I ordered everyone into the cars and hit the gas to fly South as things were developing almost overhead, we went through a few valleys and drove literally under the first stages of a developing Wedge Tornado, Wet Rfd rainfall hit our car from right to left (W-E) And then thousands of leaves of tress from left to right (E-W) We had to bomb south fast out of the circulation. 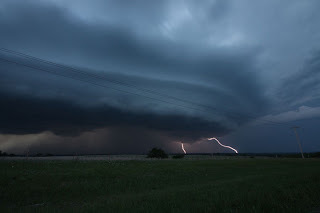 We carryed on and crested a hill with a great vantage point back to our North (From where we had just come from) and there it was a Wedge Tornado with Power flashes crossing the road where we had just been. After some pictures of Tornadoes 2 & 3 we then went further east and set up for some more Lightning and Cell Structure Photography and noticed Tornado number 4 dropping down and a Text Book Perfect Classic Supercell in front of us. By now it was completely dark so we followed a little way further east for some more pictures before calling it a night and heading back South into Texas to meet the later arrivals and try to tell them how our day had gone. 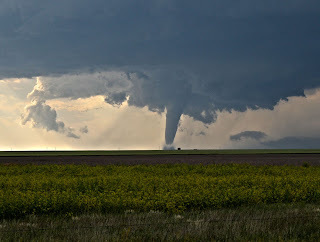 We were NOT Very popular with some of the people, but they would see a nice Tornado just 6 days later anyways. It's only 12 weeks until we embark on Stormchase 2012, so I will be re-living my favourite 12 Chases over these weeks and today we start with the Campo Tornado from May 31st 2010. After picking up the guests from Dallas Fort Worth Area I already knew a Solid Moderate Risk would be available in South Central Nebraska for Day 2 of the trip, the original plan was to head up to Oklahoma City for the first night and then a travel/positioning day for Day 1 to get into position for an expected Moderate Risk on June 1st. The trip up I-35 Was quite eventful with numerous summer type thunder showers along the way, we booked and stayed in the Guest Inn @ Norman, later that evening a SE Moving Borderline Supercell producing large hail initiated just to the North West of Oklahoma City and was moving at a snails pace SE Wards towards our position. That particular cell kept us awake most of the night with amazingly close Cg's, the worst of the Hail missed us and impacted Lake Thunderbird to our east. Upon waking up the next morning a "See Text" risk in SE Colorado had been Upgraded to a Slight Risk with a marginal 2% warning for Tornadoes. This gave us a tough decision to either stick with Plan A, And head North on I-35 Through Kansas or go for a bonus day way out to our west. The drive for the 31st May's risk was still 5-6 hours drive but I calculated if we ended up somewhere near Liberal (Kansas) we could still make S Central Nebraska the next day so the decision was made and off we trecked down I-40 Westbound. After stopping for Lunch in Weatherford a lone Supercell had initiated just SW Of Springfield (Colorado) this storm was hardly moving and had attached itself to a stationery boundary. 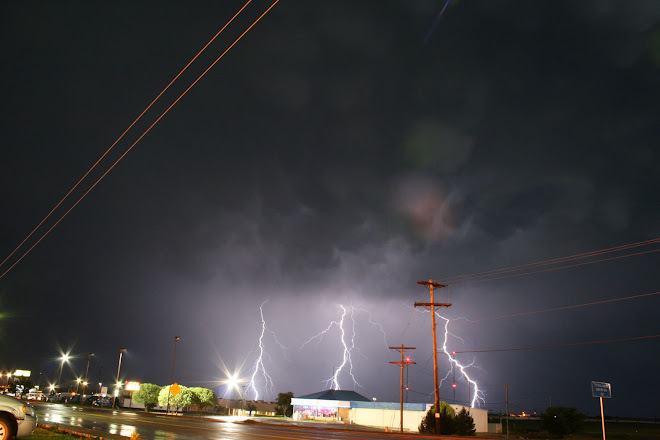 It was still a good 3-4 hours drive away and we started to get reports of Funnel Clouds already being produced, the chase was well and truely on now so we headed North West towards Woodward and then onto Guymon in the Oklahoma Panhandle. At about 7pm we finally started to get a glimpse of the Supercell to our North West, it was an absolutely beautiful Classic Supercell which was moving SE @ 5mph. I took a couple of farm roads North to sit about 3 miles from the Colorado/Oklahoma Panhandle Border. 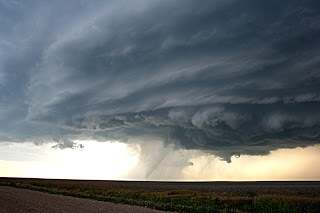 We arrived just in time as no sooner had we got out of the car and set up the cameras then the amazing Campo Tornado touched down, fit first looked like a perfect Wizard of Oz Tornado coming at us across the open Prairie but quickly turned into a Fat Stovepipe Tornado. This Tornado was on the ground for 18 Minutes. The original Mesocyclone then occluded and Tornadoes number 2 and 3 were put down, Number 2 on the ground for about 2 minutes and number 3 for about 5 minutes. The Supercell then took on amazing Sawblade characteristics with sick structure, it finally left it's boundary at about 825pm and started moving South, after that is quickly died, we then had another 3 Supercells coming up at us from Dumas, I stuck with my plan to stay in Liberal and at one point we were in the middle of the donut hole of 4 Surrounding Supercells, we stopped in Guymon and ate a late dinner in Braums and let the storms overun our location, after that we headed the short journey North to Liberal to stay the night.